In the top left you will see my Grandmother Mother and Grandfather known as Pop and Granny. 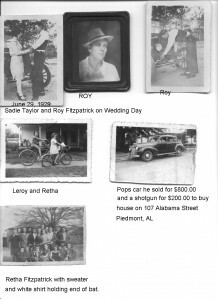 Sadie Mae Taylor Fitzpatrick and Lee Roy Fitzpatrick on their wedding day June 29, 1929. I am not sure where they were married but I would say Alabama. I will have to ask their daughter, Aunt Janice. No one on the face of the earth but me will know what they meant to me. They basically raised me from birth until I was 13 and Granny passed away and then two years later Pop lost his life in a car wreck in Florida. I am so thankful for their wedding day. If it had not been for that I would not be here today. Happy Anniversary Pop and Granny, I love you and know you are happy in your new home together! There is never a day that passes that I do not think about you both. My Brother David Patrick Epps, Keeper Of My Clock. I carry on all kinds of things here and on Facebook, and a lot is fun and some is serious. This story about what I am going to tell you is the truth. My brother David was stationed in the Coast Guard in Florida. Chatahoochee, FL to be exact. He met his wife and married. He saw these clocks and started them . I wanted one really bad. I was doing ceramics at that time and we agreed to swap a clock for some Masonic coffee cups. That was ok by me. 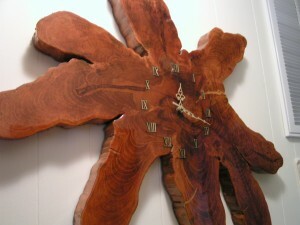 David made me this clock I want to say in the early 80?s to middle 80?s. 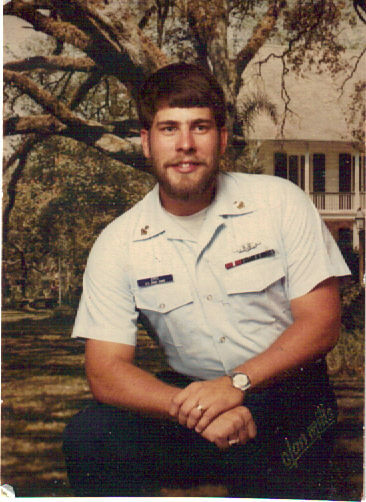 He then with his wife moved to Nags Head, NC and then on to Hawaii with his wife and two little girls where he passed away on a ship January 1990. DAVID IS KEEPING THIS CLOCK RUNNING. We forget about the batteries in the clock. Reason being they rarely run down. Now if you have a clock running on batteries don’t you think at least once a year you will have to change it? I think it is two AA batteries that it requires. I won’t dare touch it until I have to. Gary and I can’t remember the last time we have changed them. It is heavy and difficult to hang back up on the wall so I know both would remember because it takes both of us to do it. I would say since I have had the clock in the middle 80?s I may have changed the batteries three times. I don’t care if the hands get bent, scuffed up or what I am not making one change to David’s clock. He is taking care of it for me. I have said the next time I have to change them out I am going to record it somewhere just to see how many years before we do it again. I know it has to have been at least 6 years since we changed it or maybe longer. Thank you David for being the keeper of my clock and keeping it running. It is one of the favorite things I have in our home. Knowing you made it and taking care of it means everything. NOW tomorrow if the clock quits working. NO ONE WILL EVER BELIEVE IT when I post it. David Patrick Epps. Your brother Tommy, Sisters, Chris and Karen have a heavy place in our hearts for you. We sure miss you “Egg”!!! I know Guilda and the girls do also.